The NZ ETS Review commenced in 2015. Stage 1 of that review concluded in May 2016 with the decision to phase out the two for one surrender with full surrender obligations in place by 2019. Stage 2 of the review is ongoing with MFE work progressing to improve the design and operation of the NZ-ETS, including how best to implement the in-principle decisions (auctioning, international units, a different price ceiling, co-ordination of decision making), forestry accounting (averaging), industrial free allocations and operational and technical matters. Consultation on these areas is expected throughout 2018. The first consultation document has been released and includes a number of proposed amendments to the Climate Change Forestry Sector Regulations 2008. These amendments address deficiencies in the current regulations, simplify processes and reduce fiscal risk to the Crown. PF Olsen are currently reviewing the proposed amendments and will prepare a submission on behalf of PF Olsen ETS participants. The consultation document can be viewed online. 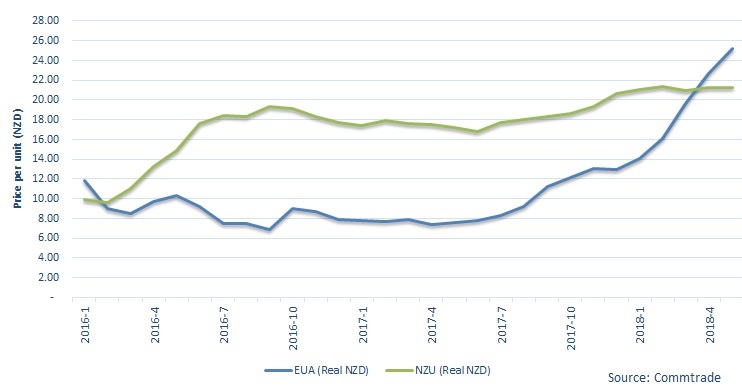 After a sustained period hovering around record high price levels, we have seen NZU prices check back somewhat through the end of May and into June. Domestic emitters had a deadline of 31 May 2018 to complete their unit surrenders, and now pressure to acquire has eased. Buyers have therefore taken a breath, while sellers have remained in the market with fresh entitlements to offer. Current pricing (as at 8th June 2018) is around $20.65.